What should a young kids music experience be like? What is the best music "method" to begin studying or experiencing music? In a nutshell, a kids first music experience needs to be positive. Infants, toddlers and preschoolers need it to be so positive that they become lifelong lovers of music. I honestly believe that this is every child's right. Parents need to explore and choose a child's music program carefully as children's music education can vary greatly from one music school to another and from one music teacher to another. Music classes need to be age-appropriate for a child first and foremost. From my personal experience with my own child, I believe it is fair to say that it is never too early or too late for a child to begin their musical training. Ear training is very important for a musician or singer and this can be started at a very early age. 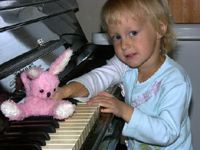 Many music classes are offered for infants and their parents. Any parent interested in attending a music class with their young child should have no problem finding one in their area. In addition, there are a wide selection of videos available should you choose to introduce your child to music in that way. Various classes for children as young as 6 months to 5 years of age are offered in most places and are geared towards kid music experience enjoyment. These classes usually involve some type of ear training, rhythmic training, scale introduction, and basic musical instrument introduction, and are meant to foster the enjoyment of music...make it fun. The music educators that teach these various methods are all interested in bringing out the musicality in each child. They are, hopefully, invested in heightening the pleasure of a kids music experience. The approach is slightly different for each method but the general goals remains the same...to produce a child who has a love of music, musical ability, self-discipline, self-confidence, a better attention span, increased memory retention and sharper focus. All of these life skills carry over into other areas of learning and that in itself is a reward for studying music.